Development of models for competencies management and customized metrics. Development of computerized systems for competencies and metrics management. Mapping the organizational and individual competencies. Development of internal communication plan. Development of action plans for implementation of management models and competencies metrics. It is a tool for alignment of management policies and organizational strategy. Provides the creation of a common language, regarding performance. Integrates HR subsystems, enabling a new way of managing people. Enables that decisions on people start to have less chance of error and greater acceptance of those involved (meritocracy). Establishes a favorable environment to monitor organizational outcomes. Enables organizational learning, in that it systematizes a continuous process of evaluation and development. Be clear and stimulating so that need little or no explanation. Being away from the comfort zone. Be daring and exciting in itself. Continue stimulating progress even without the continued presence of leaders. Be consistent with the ideology of the organization. Be aligned to the business in order to contribute to organizational results. Align the behavior of professionals to those desired by the company. 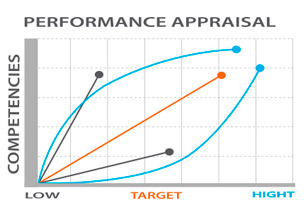 Guarantee or predict outstanding performance.